The notch in the centre of the picture in the hazy background hills is the mouth of Glen Turret. The shoulders of the 'Munro' Ben Chonzie are on the left, by the tree. Basically this is a view looking due north into the Highlands. While Glen Turret has no through road; to the east, (right) just out of shot, is the Sma' Glen. This glen is a historic through route between Highland and Lowland. Dalpatrick Ford, where the cattle crossed the River Earn in the days of Scottish cattle droving. Though it looks an attractive-enough bit of Perthshire countryside, there is a ghostly network converging on the old ford here from several Highland routes out of the north. And they are all related to the long-vanished trade of Scottish cattle droving. The peaceful Dalpatrick Ford was a main crossing place for the herds, raised in the north, when they were driven south to the autumn market or tryst; where they were bought by dealers from the south. Roughly in the first half of the 18th century, this market took place in nearby Crieff, then later at Falkirk, further south, beyond the River Forth. A straight line from Dalpatrick Ford back north towards the entrance to the Sma Glen more or less follows a road still called Highlandman’s Loan – a historic name in the story of Scottish cattle droving, recalling its connection to the hardy Highlanders who came this way long ago. Cattle in the old days were black! When it comes to pinning down what sort of cattle the drovers were moving south, most sources speak of the small black and wiry Highland cattle, often going by the name of kyloes. These seem to have originated in the far west of Scotland, mostly on the islands. 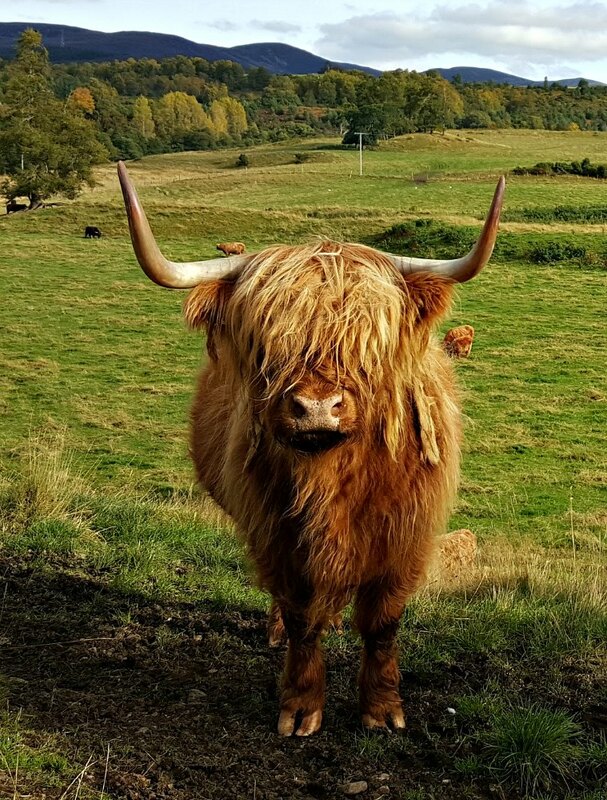 The red hairy coos that are practically an icon of Scotland today also came from the west, but were bigger, though perhaps not as big as some of the pedigreed specimens so beloved of tourists today. It is extraordinary to think that in its cattle-dealing heyday, the little resort town of Crieff was virtually Scotland’s largest financial centre – and, in an eerie echo of today’s straitened circumstances, much of the cattle business was done on credit. There wasn’t much cash around, so the dealing was based on bills of exchange. This written promise to pay was in circulation pretty much like a banknote. There was even a bank crash in 1772 which brought down several embryonic financial houses who had interests in the cattle trade. The River Earn at Dalpatrick Ford near Crieff. In Scots, the word tryst means an agreed meeting place – so that the dealers trysted with the owners or drovers to meet them in order to do business. There’s a strand of meaning of the standard English trust in there as well – and so we return to the idea of credit, and the collapse of economies when that trust is absent. Classic red Highland cow or bull or...hard to tell really. The upward pointing horns suggest it is female though. Strictly speaking, Crieff’s role in the story of Scottish cattle droving as an important tryst ended not because of financial reasons but because of the more peaceable political situation in the latter half of the 18th century, when the Jacobite threat had faded and English dealers felt more confident about travelling north of the Border! The tryst moved to Falkirk as it was nearer England. But just imagine those drovers, as they made their way through the mountains in all weathers, hoping for a good price for their speculative purchases on the hoof. And in turn, when changing economic conditions impacted on the Highlands and emigration sadly became almost the norm, the skills of the hardy Highland cattle drovers were exported and made their mark in the New World. Today you can still take part in Crieff’s very own modern take on the old market. The Drovers’ Tryst is an autumn festival with the emphasis on discovery of these old roads by walks and tours (though there is plenty of other entertaining stuff as well. And it all helps to keep the story of Scottish cattle-droving a part of our heritage. There is more on the old resort town of Crieff here. Finally, the most famous Scottish cattle droving expert, of course, was Rob Roy. Follow the link here for a page about him.